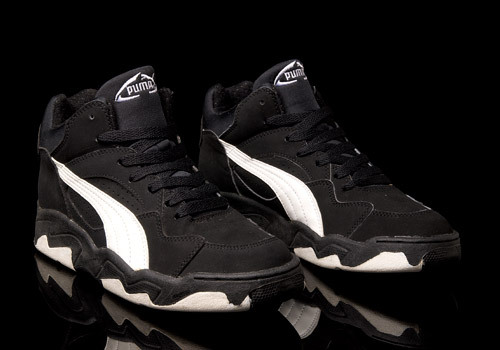 The interesting thing about PUMA’s back catalogue is the lack of awareness that exists in the 21st century sneaker scene regarding their vast array of high top silhouettes. 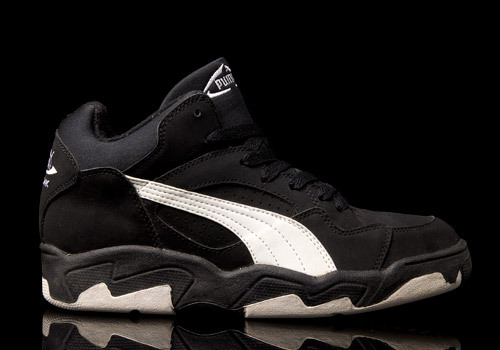 Everyone seems to know about the Clydes and Suedes and States of yesteryear, but nobody’s raving about their sweet collection of mid and high top models, let alone even whispering about them. 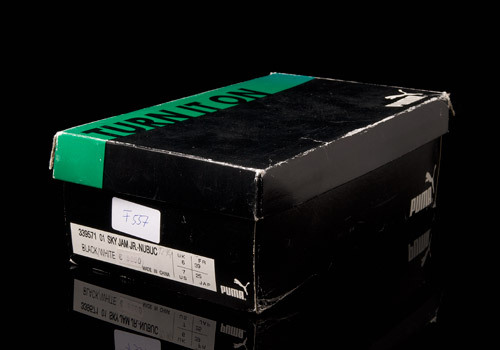 I personally think it’s time for a journey backwards, and as I dug into our eatmoreshoes archive crates I came across a model that I love for its sheer simplicity. 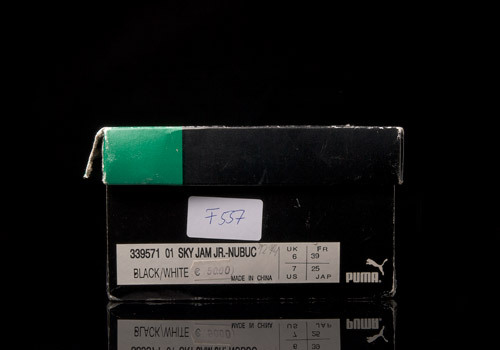 The PUMA Sky Jam is a mid cut basketball shoe that puts together all the proper ingredients for a delicious hoop boot from the mid 90s: chunky shape, nearly over-padded innards, simple two tone colorway, overlapping layers making up the complex and quite loud upper architecture, geometric midsole features, super stiff toe box, and a non-marking outsole designed to make you wanna bounce off the court. It’s the kind of shoe, that, once I’ve opened the box and discovered it’s a full three sizes too small, I still attempt to put it on my foot anyway. They’re just too damn tasty. 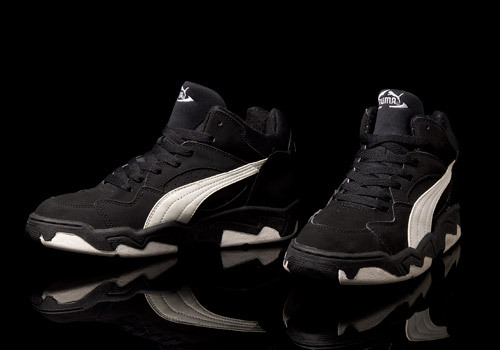 It was actually quite common among black-colored 90s b-ball shoes to be made of synthetic nubuck and this release does the design direction justice with super soft patches that merge almost seamlessly with the textile tongue and ankle collar. 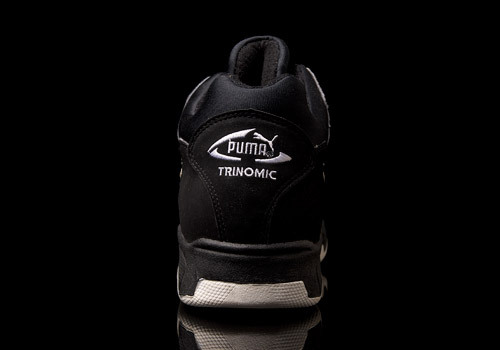 Another key feature of the Sky Jam is PUMA’s Trinomic technology. 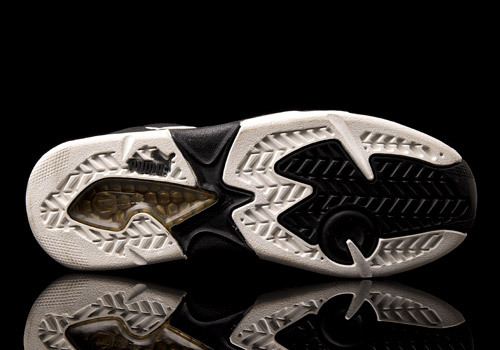 In layman’s terms, most shoes with foam-based soles didn’t last so long, losing both their cushioning and stability over time. 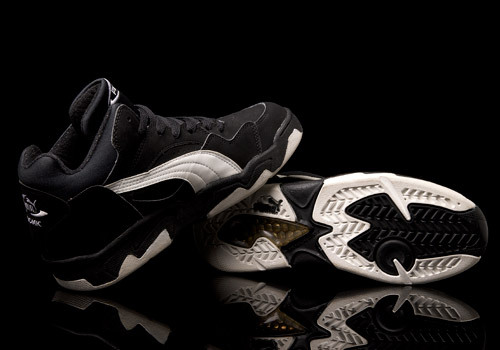 Not only does the honeycomb cell structure embedded into a Trinomic outsole enhance both of these aspects, but it also helps the overall sneaker to be more durable when it’s used for extended periods of time. Wanna look like you’re ready for the court but keep your style to a quiet confidence? I surely do, even though I haven’t touched a basketball in ages, and I can honestly say I’m emotional knowing this box fresh pair will never wrap themselves around my feet.